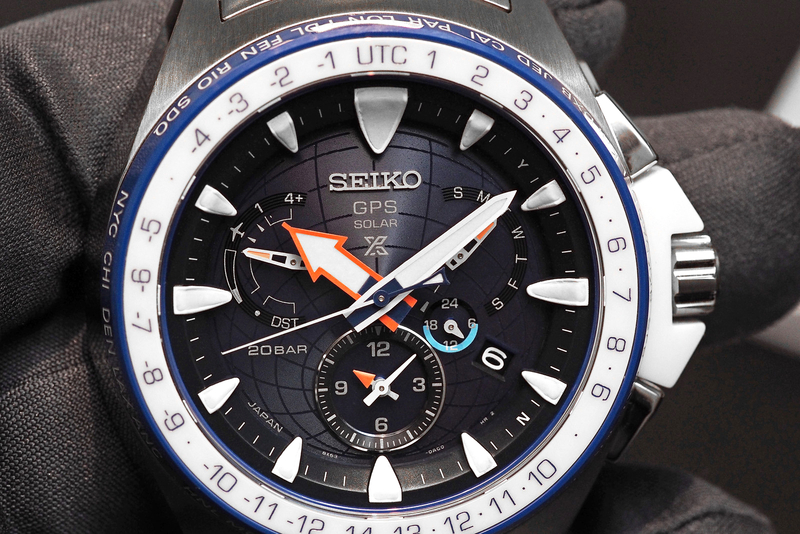 The Prospex Marinemaster GPS Solar Dual-Time, unveiled at Baselworld 2016, is the first Seiko, other than the Astron, to utilize Seiko’s unique GPS Solar timekeeping technology. Crafted in corrosion resistant titanium, the Marinemaster case and bracelet feature a super-hard coating to protect against impacts. The case measures 48.5 mm x 14.7 mm and is topped by a highly durable fixed ceramic bezel. The two-tone bezel is bright white on the top (with the numeric UTC codes in blue), and bright blue on the flange (with the 40 world time cities engraved in white). The bracelet has a three-fold clasp with push button release, with a secure lock and slide adjuster. 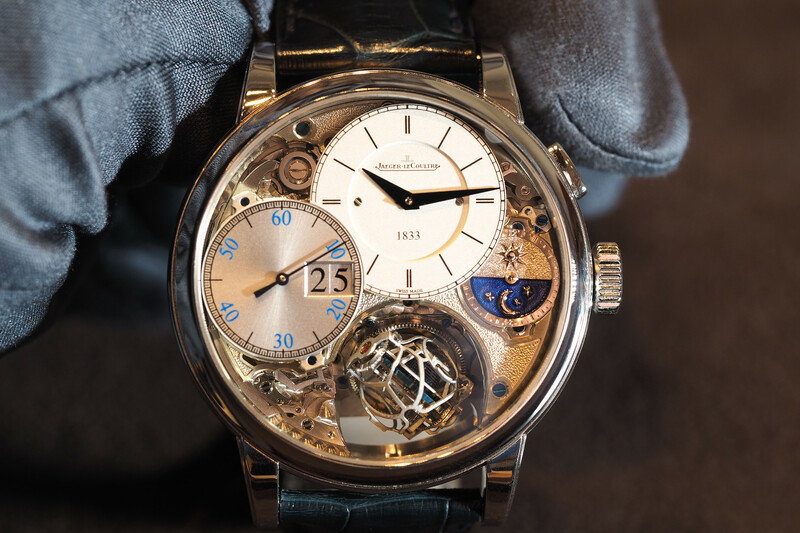 A screw-down crown and caseback ensure a water-resistance of 200 meters. The crown features white ceramic crown guards. The sapphire crystal has been coated inside and out with a super-clear coating that minimizes glare. Legibility is further enhanced through the use of large applied markers and hands that have been treated with Seiko’s latest Lumibrite material. The marine inspiration of the watch is reflected by the hands and markers that are shaped like the profile of a yacht, as seen from the masthead. This is a professional watch, made for use on the sea, and so the crown and buttons have been designed to be operated, even when gloves are worn. Additionally, the case and bracelet were specially shaped to prevent the edges from catching on a rope or line while sailing. A bright blue dial with a world map motif matches the blue ceramic bezel and doubles as a receptor for sunlight that charges the battery to power the watch. Driving the functions of the is Seiko caliber 8X53, which uses GPS signals to regulate the time, and to make time zone changes (at the press of a button). Accuracy is +/-15 seconds per month, even without receiving the GPS calibration signal, which requires only a clear view of the sky, anywhere in the world (and even works at the poles). Notably, if a view of the sky is not available the watch saves the most recent GPS calibration, and the time can also be manually set (the traditional way) via the crown. A multi-function display between 9 and 10 o’clock indicates the number of satellites the watch has a signal reception with (1-4), the remaining power reserve, whether DST (Daylight Savings Time) applies locally, and whether the watch has been set to in-flight mode or not (a feature that prevents interference with the operation of electronic devices while on an airplane). 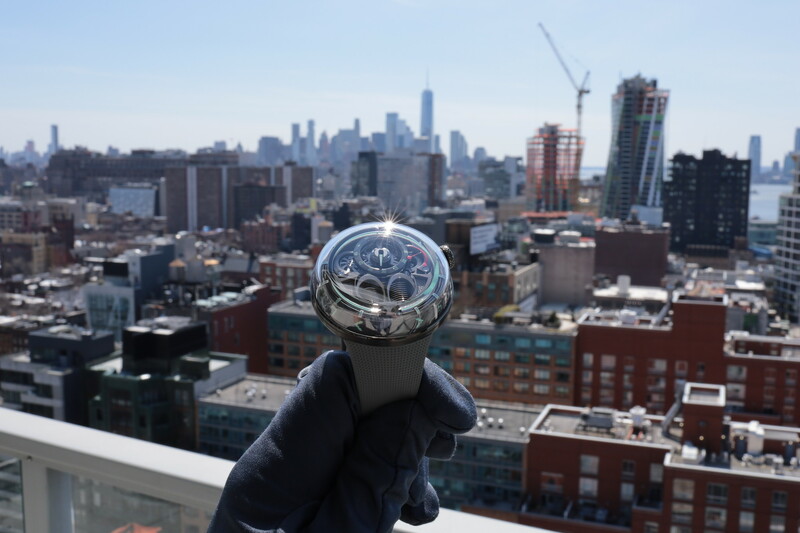 Furthermore, the Dual-Time function allows an ocean sailor, for example, to know at a glance the time in his or her home port (via the hour and minute display located at 6 o’clock) as well as local time. This display also works in conjunction with the 14-hour AM/PM (day/night indicator at 4 o’clock). Additionally, a perpetual calendar function corrects the date (located in a small aperture at 4 o’clock), even in February, or during a leap year (until 2100). There is also a display for the day of the week, by hand, at 2 o’clock. The Prospex Marinemaster GPS Solar Dual Time is being produced in a limited edition of 1500 pieces and it will be available for $3000 in Fall 2016 (Ref. SSF001J1). 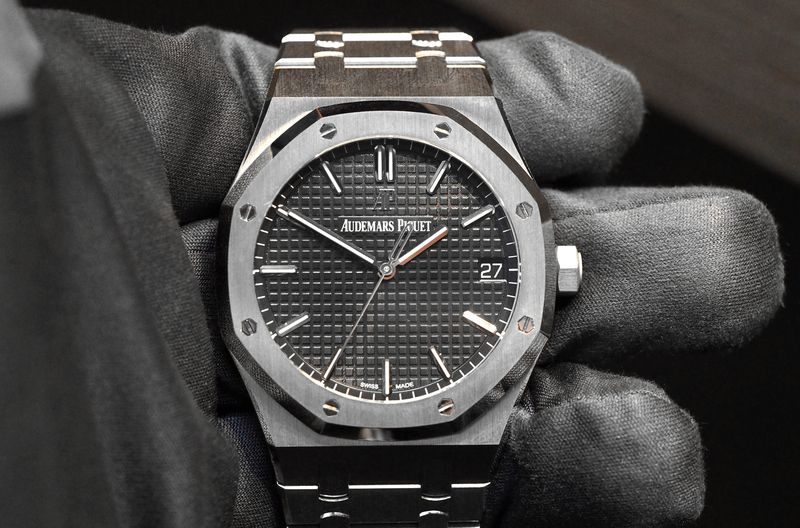 There is also a regular production version with a black dial, and black and gray ceramic bezel (Ref. SBED003), for a retail price of $2600.